Entrants who do not receive the Centennial Scholarship will automatically be considered for other scholarships. In addition, they are welcome to apply for financial assistance, a needs-based program that is available to all SMS applicants and students. Who can apply: New students entering grade 9, 10, 11, or 12. Apply for the Centennial Scholarship and get the all-girls advantage working for you in Grades 9, 10, 11 or 12. 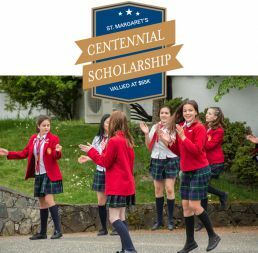 St. Margaret’s School is pleased to offer a scholarship directed towards a new day student entering grade 9, 10, 11 or 12 and covers full tuition fees until graduation. The successful candidate must be a well-rounded individual who demonstrates excellence in a combination of academics, leadership, service, and extracurricular involvement. The selection will be based on all aspects of student life, not focusing exclusively on academic achievement. For more information, contact Gail Bateman, Admissions Assistant or call 250-479-7171 ext 2127. To be eligible, students must be BC residents. Boarding students (5 or 7 day) will still be responsible for the boarding component of fees. SMS is proud to provide a number of awards and scholarships to honour achievement by our current students. While excellence in academics is certainly recognized, these awards also celebrate other highly prized attributes in alignment with our school values: leadership, community involvement, and service. St. Margaret’s School is pleased to offer two scholarships of $5,000.00 each for new applicants entering our Middle Years program. This scholarship will be renewed for every year the successful candidate remains in the Middle Years program, which comprises Grades 5 to 8 at St. Margaret’s. This scholarship fund was established in 2014 to thank the Lakehill community for its ongoing support of St. Margaret’s since relocating its campus into this area in 1970. The successful candidate must be a well-rounded individual who demonstrates excellence in a combination of academics, leadership, service, and extracurricular involvement. The selection will be based on all aspects of student life, not focusing exclusively on academic achievement. St. Margaret’s School is pleased to offer a scholarship of $15 000.00 for a new North American boarding student from outside British Columbia. Ms. Gilliam currently lives in the United States and graduated from SMS in 1955 before she attended McGill University and Harvard University. Ms. Gilliam has had a successful career in business and has been a trusted advisor to a number of Fortune 500 companies. The successful candidate must be a well-rounded individual who demonstrates excellence in a combination of academics, leadership, service, and citizenship. The selection will be based on all aspects of student life, not focusing exclusively on academic achievement. Thanks to the generosity of our donors, St. Margaret’s School is now offering an International Entrance Award. For over 110 years, SMS has welcomed students from all over the world, placing a high value on diversity in the classroom because exposure to different cultures is life enhancing. Now, through this International Entrance Award, priority will be given to applicants from countries that are currently under-represented at SMS. SMS provides girls with exceptional learning and life experience. Girls take responsibility for their learning while developing individual worth, academic excellence, personal wellness, and a deep connection with nature. Since 1908, our motto has been “Service with Love”, which means giving back with gratitude, serving your community and the world. 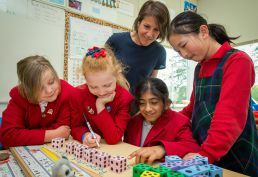 The International Entrance Award celebrates incoming boarding students from around the globe who are leaders in their schools and communities at home and seek to continue those leadership roles in their new home at St. Margaret’s School. Thinking of applying for this award? Tell us how you you’re a student leader in your school, your neighbourhood or your broader community! The awards will be given to new SMS boarding students who embody our community spirit and “Service with Love” attitude. Who can apply: Incoming boarding students intending to stay at SMS until graduation. Priority for the awards will be given to students from new regions from which SMS has historically received few students. An essay, not more than 1,000 words, on the following topic: How will you bring the experience you gained and the skills you developed through student leadership in your community at home to your new home at St. Margaret’s School? SMS is deeply grateful to our donors who make our awards possible through their generous support. In fostering a culture of excellence at our school it is important to be able to recognize girls for their tireless pursuit of both personal improvement and enhancing the community around them.